Any wireless IP microwave system will work as an STL, just as any camera (or phone) can take a picture. But as to how far and how robust, and for how much, that’s when the picture starts to get a little fuzzy. There’s licensed versus unlicensed systems. Part 101 versus Part 15. Full duplex or half. Matters of throughput, range, delay and buffering, and where to install it and with what – it’s all-important in the wireless IP world. And certainly there’s cost, which can start at $500 for a basic unlicensed-frequency wireless IP system complete with radios and dishes and run up to $30,000 for a licensed-frequency system, depending on how far, how fast, and how reliable you need that link to be. Systems vary, but they all have a few basic advantages. When you put up an IP link from the studio to the transmitter, your transmitter site immediately becomes part of your Ethernet network. 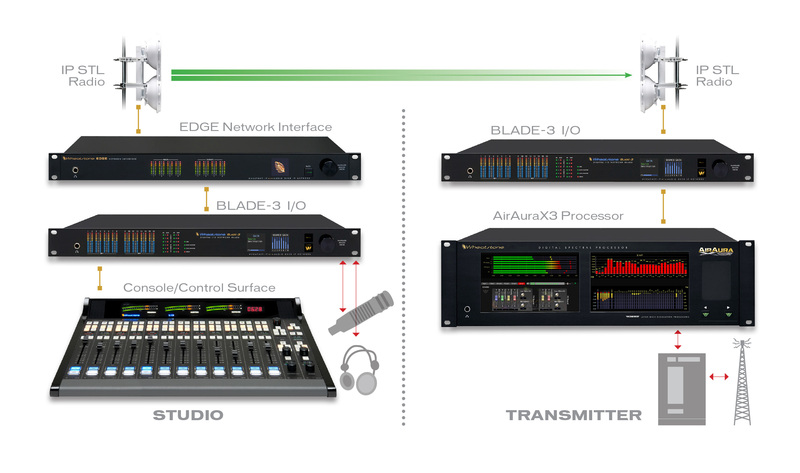 Audio from a WheatNet-IP audio network I/O BLADE or EDGE unit connects directly into the IP wireless radio through RJ-45 connectors, and because it’s all IP, that means you can carry audio, video, voice-over-IP, and data of all kinds. Back and forth. Both ways. If you have video surveillance at your tower site, you can carry that data back. If you have a Burk or other transmitter remote control system, you can carry that data back. And, if your transmitter is remotely located with spotty or no cellphone coverage, you can put VoIP out there and carry that back and forth over wireless IP. Your remote tower site is now part of your network, even though it’s miles down the road. Wireless IP systems can go some distance, too. “Our longest shot on wireless IP microwave is 55 miles,” says Jeff Holdenrid, who specializes in wireless IP for broadcast and other emerging markets for DoubleRadius engineering firm. Jeff has installed dozens of wireless IP microwave systems with our WheatNet-IP audio network in the past five years, most averaging in the 20 to 25 mile range. The make or break rule is, as always, line of sight. As for throughput, IP microwave has plenty of that, too. For example, a WheatNet-IP audio IP-88D BLADE into an IP wireless radio can run 8 stereo channels across a wireless IP link and still have enough bandwidth left over for all those things we just talked about: video surveillance, VoIP, remote control and other periphery functions. Your choices are generally 5.8 GHz unlicensed wireless IP systems or licensed wireless IP systems in the Part 101 band, usually 6 GHz or 11 GHz (18 GHz and 23 GHz under Part 101 aren’t all that practical for ranges beyond one to two miles). Licensed systems are generally full duplex, whereas unlicensed wireless IP systems are almost always half-duplex. The former has the obvious benefit of a licensed frequency as protection against someone using and interfering with that frequency for their purposes, but the latter can be useful, as well. IP wireless systems operating on the unlicensed band often make a good option as an affordable backup STL. They’re also priced low enough to bring VoIP communications to transmitter sites that have limited or expensive cell coverage. “A lot of broadcasters are paying $600 or $1000 a month for their Internet connection to the transmitter site. Other than a tower climb to install the wireless, their return on investment is two to three months compared to paying for a leased line from their provider,” explains Jeff. One critical difference between unlicensed and licensed wireless IP systems is how the two handle latency. According to Jeff, latency on an unlicensed system can jump from 2 milliseconds up to 12 or 20 milliseconds depending on interference or something as simple as changes in weather patterns. Comparatively, IP wireless radios operating on a licensed frequency have a consistent, lower latency, typically around 100 microseconds. But there are plenty of uses for unlicensed 5.8 GHz IP wireless systems, especially now that Wheatstone introduced in April a special network unit, the Network EDGE, which has more data buffering built into it in order to handle the latency swings typical of unlicensed wireless IP radios. The EDGE provides the necessary delay as a buffer to any latency shifts that come across the link, which acts as a interface between the WheatNet-IP audio network and the IP radio. “Unlicensed IP has taken off because for 1,000 dollars you can get a system, and now that the EDGE can hold the clock time consistently, we’ll probably see more applications for these,” says Jeff. If you’re considering an unlicensed system, features like interference mitigation will be important. “In the 5.8 world, there’s the signal to interference ratio – how much noise it can take before the link drops. Some of these products have interference mitigation, where they see the frequencies all the time, so if someone puts something up on your band, it jumps to the best frequency it can perform on. If you’re considering unlicensed, that’s going to be a big product differentiator,” says Jeff. Whether you decide on licensed or unlicensed, you’ll need IP wireless radios and microwave dishes on each end of the STL, and a good surge protector. For more information on WheatNet-IP and IP microwave STLs, contact your Wheat sales team. Next month in Wheat News, we’ll explore licensed IP microwave systems.